That updated data (.pdf) comes from a new Congressional Research Service report into military casualty statistics that can sometimes be difficult to find — and even more difficult for American society to fully appreciate. It almost certainly understates the extent of the costs of war. Start with post-traumatic stress disorder, or PTSD. Counting since 2001 across the U.S. military services, 129,731 U.S. troops have been diagnosed with the disorder since 2001. The vast majority of those, nearly 104,000, have come from deployed personnel. More-severe TBI is measured along those metrics, lasting longer than a day. Nearly 6,500 of of those cases are “severe or penetrating TBI,” which include the effects of open head injuries, skull fractures, or projectiles lodged in the brain. 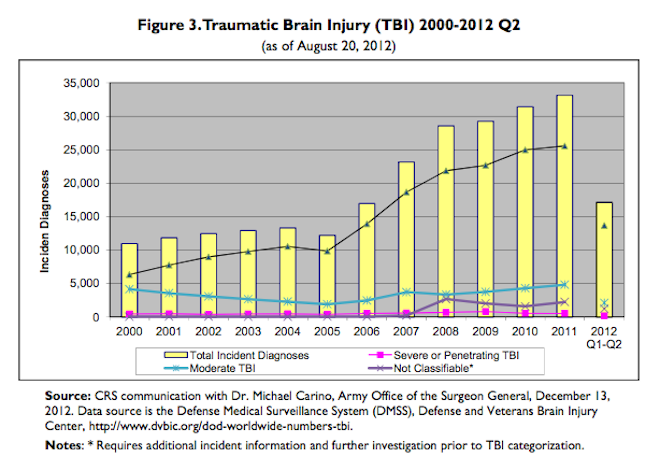 Like with PTSD, the TBI diagnoses scratch the surface. The military’s screening for TBI is notoriously bad: One former Army chief of staff described it as “basically a coin flip.” Worse, poor military medical technology, particularly in bandwidth-deprived areas like Iraq and Afghanistan, have made it uncertain that battlefield diagnoses of TBI actually transmit back to troops’ permanent medical files. Amputations are a feature of any prolonged war. Almost 800 Iraq veterans have undergone “major limb” amputations, such as a leg, and another 194 have experienced partial foot, finger or other so-called “minor limb” losses. For Afghanistan veterans, those numbers are 696 and 28, respectively. The Iraq war is over for all but a handful of U.S. troops and thousands of contractors. The Afghanistan war is in the process of a troop drawdown through 2014 of unknown speed and will feature a residual troop presence of unknown size. Even if the U.S. deaths and injuries in those wars may almost be over, the aftereffects of the wars on a huge number of veterans will not end.